If for any reason flow through the pump decreases or ceases, due to a valve closure on either side of the pump, a partial blockage or total absence of liquid, the current drawn by the motor will drop. This drop in drawn amperage is recognised by the Dry-Cut which, in response, enacts a cut to the pump power supply, if and only if the drop in current lasts for the full time set on the cut-out delay. The Dry-Cut incorporates an automatic reset mode, following a trip out due to an under current condition. The Dry-Cut is designed for a standard 7 seconds override for the initial start-up current. This override delay allows you enough time to set up the unit. 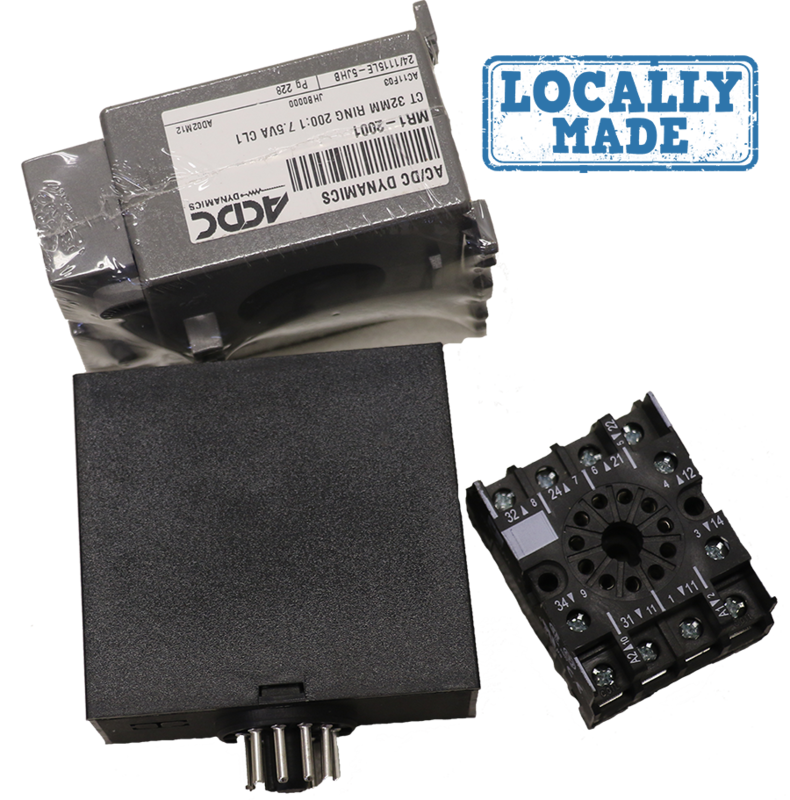 Contact across pins 9 and 10 must be provided bt a voltage free contact, either an auxiliary contact on the start button or an auxiliary relay contact. Bridging pins 9 and 10 energises the ‘Dry-Cut’ unit. The contact can be either instantaneous or continuous, however, the contact must be broken on pump cut-out. Contact one of the motor phases through the centre of the current transformer (C.T.) and connect S1 and S2 to pins 1 and 11 respectively. Connect a resistor across S1 and S2. When the pump is running under its normal load, the A.C. voltage across S1 and S2 should be between 1,7 and 3 volts. If the reading is higher or lower than this, adjust the resistor value accordingly. The following is a guide to the resistor values. The contacts betwwen pins 2 and 3 are normally open and are connected in series with the motor control relay and the stop button. The contacts close when the unit is energised via pins 9 and 10, then reverts back to an open contact when the unit detects a drop in the motor current. (a) Adjust the load set potentiometer fully clockwise (approximately 15 turns). (b) Adjust the cut-out delay fully clockwise. This gives a 30 second cut-out delay, during which time the load potentiometer can be set. (c) Switch on the A.C. power to the unit and ensure that the red ‘no load’ lamp comes on. (d) Start the pump. On starting, the pump will run on the 30 second cut-out delay. (e) During this time period adjust the load set potentiometer anti-clockwise until the red ‘no-load’ light becomes a dull glow and the green ‘on-load’ light comes on. Adjust a further – to 1 turn depending on the sensitivity required. (f) Adjust the cut-out delay as required. Fully anti-clockwise gives a zero delay. Fully clockwise gives a 30 second delay. (g) To ensure the unit is operating correctly, close either the suction or the discharge valve. This should cause the pump to cut out within the selected cut out time. If the pump does not cut out, then the load set potentiometer must be turned a – turn clockwise. Repeat the procedure until the pump cuts out on valve closure. NB. Step (e) may require repeating several times on initial run up to obtain the correct setting, as the ‘Dry-Cut’ will go into a ‘no-load’ mode if the ‘on load’ condition has not been met before the expiry of the start up time.